Reverdia announced today that Marcel Lubben (1967) has been appointed President, effective January 1, 2014. Reverdia, a joint venture between Royal DSM and Roquette Frères is dedicated to be the global leader in the market for sustainable succinic acid. Reverdia combines DSM’s expertise in Materials Sciences and biotechnology with Roquette’s know-how in plant-based raw materials processing. Reporting to the Reverdia board, Lubben will be responsible for developing and managing Reverdia into the next phase of growth. 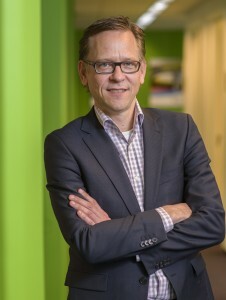 Lubben replaces General Manager Will van den Tweel who successfully led the start-up of Reverdia. Van den Tweel drove the joint collaboration between Roquette and DSM on Biosuccinium™ and was one of the founders of DSM’s innovation initiatives into Industrial Biotechnology. An announcement about his transfer will be made in due course. Lubben joined DSM in 1994. He held positions in Research, Business Development and Marketing & Sales in DSM Pharma Chemicals and DSM Biologics before transitioning into the industrial biotechnology sector. In 2009, he was appointed Managing Director Licensing for DSM and became Managing Director Venturing & Licensing in 2011. In 2012 he became Vice President Bio-based Chemicals & Materials, and he served as a member of the Reverdia board from mid-2012 until the end of 2013. In December 2012 Reverdia began operations for Biosuccinium™ in Cassano Spinola, Italy, with a capacity of about 10,000 tonnes/yr; the world’s first dedicated large-scale plant for the production of succinic acid from renewable resources. With this facility up and running, Reverdia is preparing for a next phase with further expansion of its production and business opportunities towards a truly global leadership position in succinic acid.Lubben holds a PhD in Organic Chemistry from the University of Groningen (the Netherlands), and is married with one daughter. Reverdia is a joint venture between Royal DSM, the global Life Sciences and Materials Sciences company, and Roquette Frères, the global starch and starch-derivatives company.Reverdia is dedicated to be the global leader in the market for sustainable succinic acid, focusing on market development by establishing partnerships with direct and indirect customers, building on customer needs and Reverdia strengths. Combining the knowledge and experience of DSM and Roquette, Reverdia produces and sells Biosuccinium™, the Company’s registered brand of bio-based succinic acid. Biosuccinium™, which is produced using a unique and proprietary low pH yeast technology, enables customers to produce bio-based, high-quality performance materials while at the same time substantially improving their environmental footprint. More information can be found at www.reverdia.com. Royal DSM is a global science-based company active in health, nutrition and materials. By connecting its unique competences in Life Sciences and Materials Sciences, DSM is driving economic prosperity, environmental progress and social advances to create sustainable value for all stakeholders. DSM delivers innovative solutions that nourish, protect and improve performance in global markets such as food and dietary supplements, personal care, feed, pharmaceuticals, medical devices, automotive, paints, electrical and electronics, life protection, alternative energy and bio-based materials. DSM’s 23,500 employees deliver annual net sales of about €9 billion. The company is listed on NYSE Euronext. More information can be found at www.dsm.com. Roquette, a French family group with an international dimension, processes renewable raw materials: maize, wheat, potatoes, peas and microalgae. Among the 5 global leaders in the starch manufacturing industry, it offers its customers a wide range of products and solutions in the fields of human nutrition, pharmacy-cosmetology, paper-board, chemistry-bio industry and animal nutrition. Present in over 100 countries, Roquette has a turnover of 3.1 billion euros. The group employs more than 7,800 employees. Its development, focused on nutrition and health and plant-based chemistry, is based on a strategy giving preference to the long-term, innovation and the commitment to achieve. Its mission: « Serve men and women by offering the best of nature » More information can be found at www.roquette.com.